"Wooden" you love a toothpowder box? I was tired of opening and closing my toothpowder jar with one hand, always afraid I would have the dreaded spill! Okay, I know I make the toothpowder so technically I have an endless supply of it, but I still DREAD the thought of having any go to waste! SO... I needed a more kid (and adult) friendly container that was stylish, like myself (and my bathroom)! So, I enlisted the help of a crafty and talented friend and created the most beautiful and functional solution... an eco-friendly, wooden toothpowder box made from acacia wood, which has natural preservative properties. GET YOURS WITH YOUR CHOICE OF DIRTY MOUTH TOOTHPOWDER 4 oz REFILL!! *Picture may show 2 oz, but the refill size if now a 4 oz. The Primal Life Organics Toothpowder Box offers a convenient and stylish way to store your tooth powder. No more fighting to screw the lid back on your regular container, while trying to balance your Toothpowder-full toothbrush in your other hand! 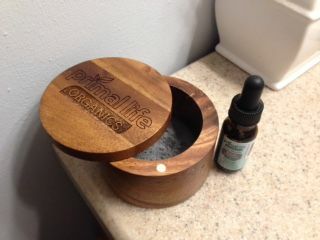 This box features a beautiful, hand-carved Primal Life Organics logo, an easy to open sliding lid, and a secure magnetic closure. This beautiful hand-carved box is made from acacia wood, and lightly coated with a food grade oil. Acacia wood has natural preservative and healing properties. Kid-friendly. Mom approved. Non-toxic. Less waste. Holds up to 2 oz of tooth powder and is easy to use for both children and adults! Easy to open, simple to close. The top slides to either side and closes with a magnetic closure. This fragrant, deeply-colored wood that is known for its durability, natural water-resistance, and its potential natural preservative and healing properties. This sliding lid offers 360° of movement and incredible ease-of-use for both children and adults. The secure magnetic closure keeps the box sealed tight and your toothpowder fresh! Each Wooden Toothpowder Box comes with the Primal Life Organics logo hand-carved into the lid. No more struggling to close your regular toothpowder lid while balancing your powder-full toothbrush in your other hand. Just slide the lid open, dip your brush, and slide it closed! Our Wooden Toothpowder Box is the perfect size; it's compact enough to store on a shelf or your bathroom sink, but large enough to hold a good amount (up to 2 oz) of tooth powder. Care Instructions: Keep dry and clean. When empty, wipe with a damp cloth. Is it safe to keep my toothpowder directly inside the box? Yes! This box is made of acacia wood; a naturally water-resistant and preservative wood that is often used for kitchens, bathrooms, utensils, and even dinnerware. It is perfectly safe to keep your tooth powder directly in the box and use it from there. How much toothpowder can I fit inside the box? The box can fit approximately 2 oz of toothpowder. Does the toothbrush in the images come with the box? No, the toothbrush pictured is to show you the size of the toothpowder storage box. gives mouth the same feel you have after your teeth are cleaned at dentist office. real test will be report from dentist after using for 6 months. The wooden box is so much more convenient and clean compared to the plastic container and screw on lid. It swivels smoothly and the magnetic closure is a plus. The box even looks beautiful sitting on the counter. The box is definitely a want and not a need, but man does it make life easier! A number of months ago I ordered 4 different toothpowder mini's to try the different flavors. It was getting to the point that I needed to order some more, so I decided to get the Toothpowder Box Package and I love it! I plan on keeping the mini containers around for traveling, but this box is awesome for home use. Bonus, it looks good sitting out on the counter! For the toothpowder I got the black peppermint. I'll be honest it doesn't taste as good as the peppermint or the sweet peppermint, but I do believe my teeth are looking whiter. That alone makes up for any lack of taste! It holds a lot too!